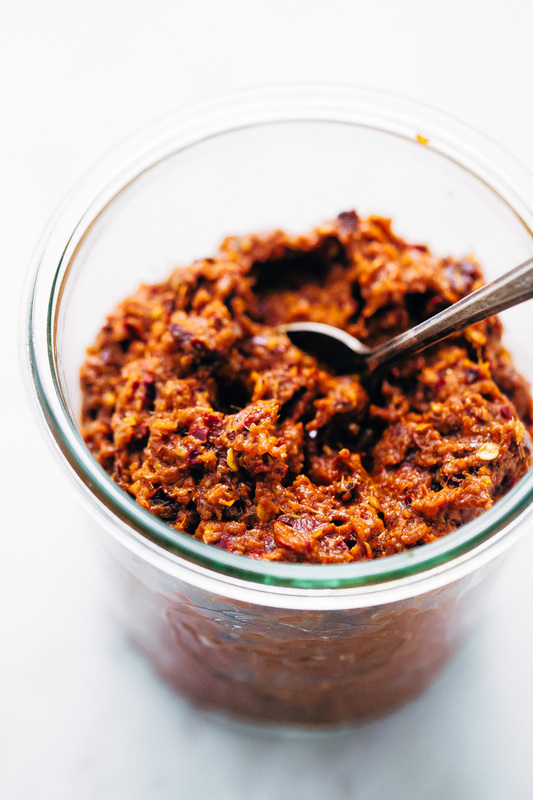 Make a big batch of homemade Thai Massaman curry paste to use all winter long! This recipe is easy to put together and tastes so much better than store-bought Thai curry paste! Here we go! Homemade Thai Massaman Curry Paste. Like what? I feel like I need to do a little bit of esplainin’ here. I’ll be the first one to tell you that up until a few years ago, I had no idea what Massaman curry was. 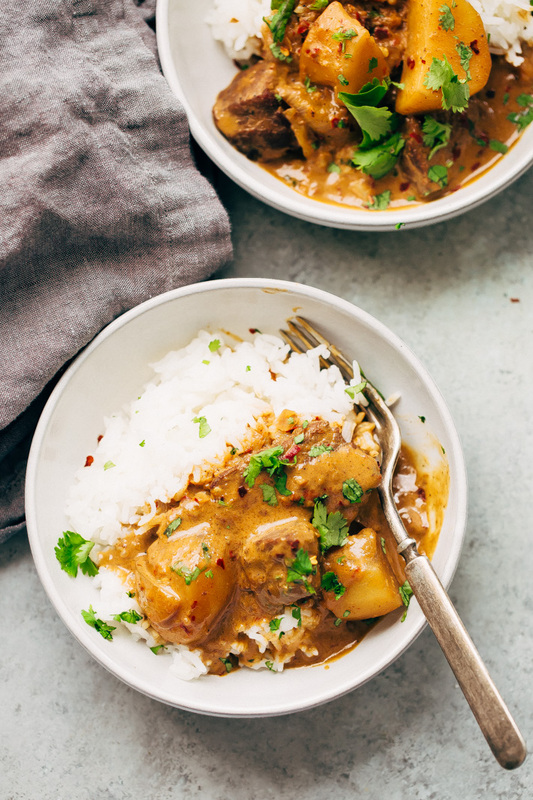 And then, I had my first bite, and I was all like ‘Woah, where have you been all my life?’ Massaman curry is a little different than your typical yellow, green, or red Thai curries. Massaman curry paste contains a handful of various spices along with your standard curry ingredients that adds such a luxurious taste to the whole dish. It started with a cardamom and nutmeg flavor explosion in my mouth. Then there’s garlic, ginger, onions, and is that cilantro and cumin? Say what? All mingling with creamy, delicious coconut milk, fork-tender potatoes, and melt-in-your-mouth chunks of beef. And while the first recipe I share with this homemade curry paste won’t be vegetarian, I can tell you right now there are plenty of ideas floating around in my head to make something similar to the butternut squash red curry  I shared last year. I can almost taste the way those warm, earthy spices are going to mingle with ingredients like butternut squash and sweet potatoes and I’m just itching to make it happen. I have to point out that I tried my darndest to make this recipe as easy as possible. When I first started researching massaman curry paste and all that goes into it, I admit, I went a little loopy just looking at the list of ingredients. So naturally, I got super intimidated and backed right off. Here on LSJ, we LOVE tasty food but do not love one thousand unknown (albeit authentic) ingredients. My thought was, I want to make this recipe as mainstream grocery store friendly as possible. And except for one single component, I think we’ve achieved it. And I’ll talk about alternatives in just a sec for that ingredient. Sounds fishy, right? What’s that ingredient you ask? Shrimp paste. Gross. My thoughts exactly; until I turned over a bottle of my favorite red curry paste. SHOCK. The same happened with green curry. At that point, there was no reason to reject it anymore; I’d already consumed it in mass quantities. I get if you’re vegetarian/vegan, have allergies, and/or just cannot get on board with that pulverized shrimp-in-a-jar. 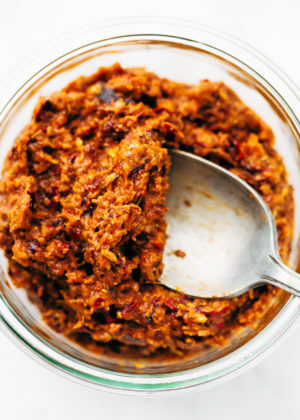 You, my friend, can easily replace the shrimp paste  (affiliate link) with fermented black bean paste  (affiliate link) or miso paste  (affiliate link). I also swapped out the traditionally used galangal and Thai birdseye chilies for the more readily available ginger and guajillo peppers. If you’re one of those people that have access to an Asian grocery store in your neighborhood or prefer to make this more authentic, more power to you! But for those of us that NEED CURRY NOW and can’t wait a second longer than necessary, guajillo peppers and fresh ginger are perfect substitutes. I’ve included an optional step in this recipe that takes maybe a total of 5 additional minutes but makes this massaman curry paste so, so much better, and that’s toasting the spices. When we place all of our spices into a clean, oil-free skillet and give them a quick 3-minute toast, the natural oils release and make this curry paste top-notch. 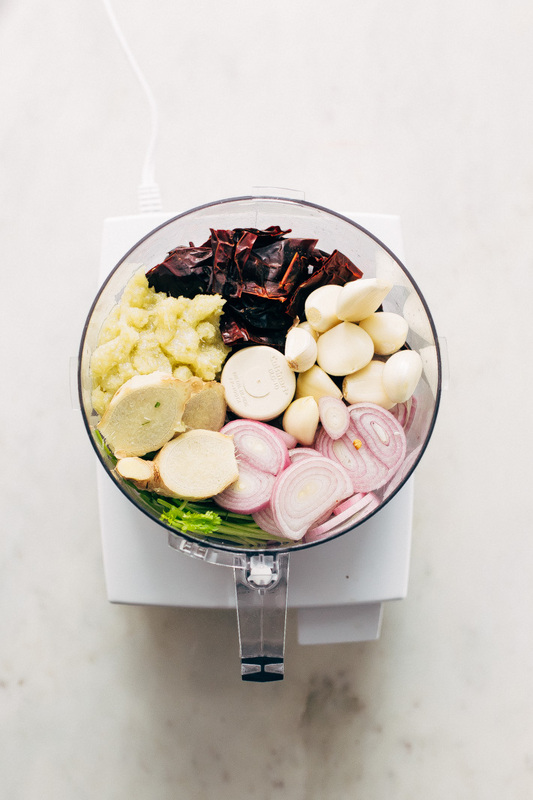 And after you put in the rest of the 5 minutes need to blitz all this together, you’ll have spent less than 15 minutes of life making a large batch of massaman curry paste that’s ready to store in your freezer and can make around four batches of massaman curry. And that’s all she wrote! Please don’t be intimidated by this. It’s toasting the spices and popping ingredients into a food processor until it breaks down into a paste. Join the massaman curry train! We’re totally obsessed. toast: Place the cumin seeds, coriander seeds, and peppercorns in a clean skillet (without any oil) over medium-high heat. Allow the spices to toast for about 3 minutes, tossing every 20-30 seconds so the spices don’t burn. The spices are toasted when they are fragrant. Let cool for several minutes before making the paste. guajillo peppers: while the spices cool, snip the peppers into 4-5 pieces and remove the seeds. You don’t want to use the seeds in the paste as it will make it quite spicy. 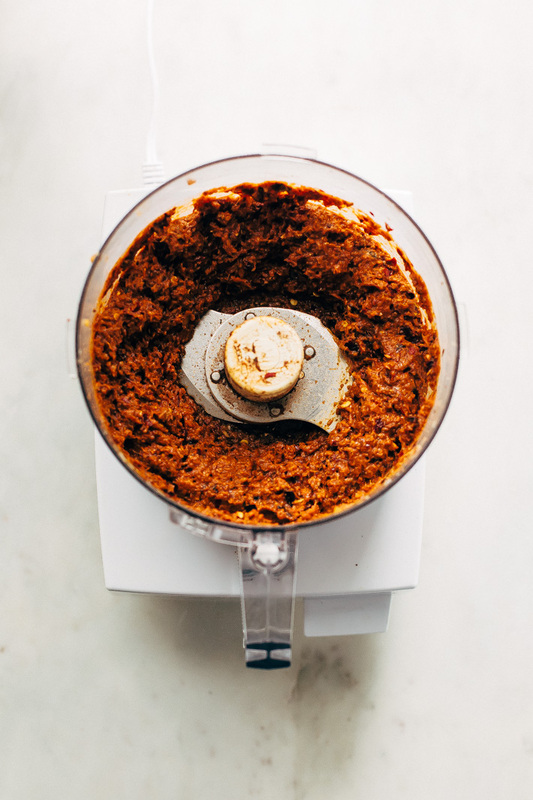 paste: Place the toasted spices, guajillo peppers, and the remaining paste ingredients into a food processor and pulse until the massaman curry paste breaks down into a paste-like consistency. This makes approximately 1 1/3 cups of paste. I use ~ 1/3 cup of paste in my massaman curry recipe so this makes enough for about 4 batches of curry. Refrigerate and use within a week or freeze in batches for several months. 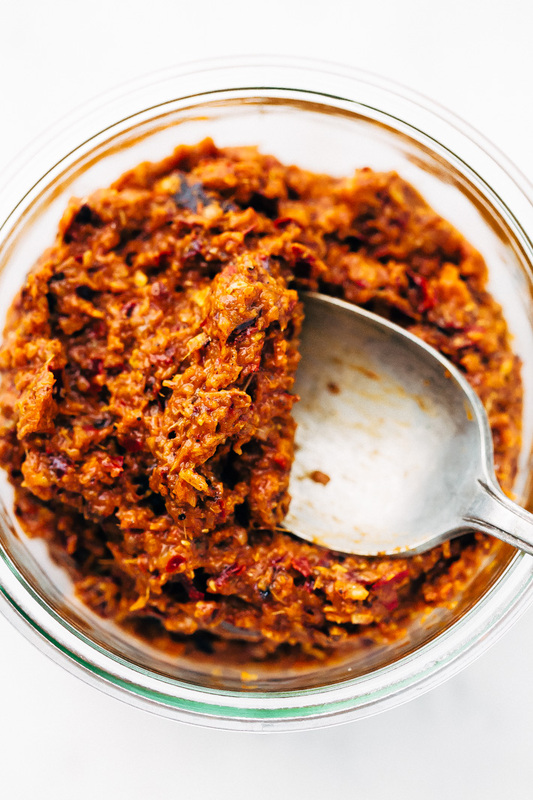 If you don’t want to use shrimp paste you can replace it with black bean paste  (affiliate link) or miso paste  (affiliate link). 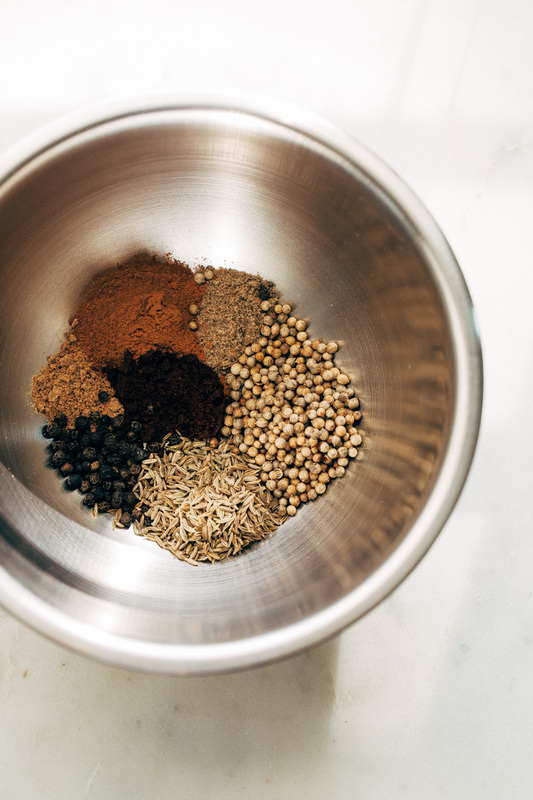 If you only have ground spices, you can replace each of the cumin/coriander seeds with 2 1/2 teaspoons of the ground version. For the peppercorns, replace with 1 1/2 teaspoon ground pepper.